In an era in which danger and violence can appear almost any time or anywhere, we are often anxious to know where our loved ones are and what they are doing. Phone-tracking apps and car-tracking devices can help provide some peace of mind and now there's a new people-tracker that takes personal monitoring a step further into a connected future. It's called Seam and it's a personal safety platform that uses a mobile app and a small wearable device. Working together, they let people share their location and environment with selected friends, family member or caregivers. 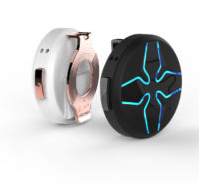 The app is available now and the wearable device, called Lotus, will be available in June. 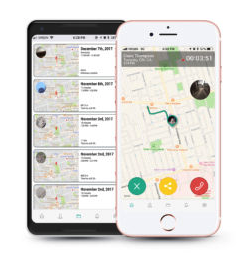 Lotus is a remote control that lets the app record a person's GPS location along with the sound and images in their current environment. The images, audio and data are streamed in real-time to up to five chosen contacts who also have the app. I would have welcomed something like Seam years ago when our teenage daughter told us she was going to a football game, but sometimes slipped away to a party. When our son travelled in South America, we could have joined him online to see the places he visited and the people he met. And Seam would have helped family members keep a closer eye on my mother when she was in the early staged of dementia. But I expect most users will value Seam for the increased sense of safety and protection they will feel when they are out on their own. The "panic button" feature, for example, will make emergency phone calls to a designated contact or to a local emergency service. Seam says its app is the only personal safety app that integrates with Google Assistant voice control. The data and images captured by someone wearing a Lotus is stored securely in the cloud for up to 24 hours. An upgrade version of the system, called SeamPlus, allows storage for up to three months and downloading for offline viewing. The Seam apps are available for free in the iOS App Store and the Google Play Store. More details are available on the Seam Technic website and @Seam_technic on Twitter. And you can see the platform in action in the video below.